Mr. & Mrs. Chaim Meer with gratitude to Hakadosh Baruch Hu for His everlasting kindness. Mrs. Fern Crane on the occasion of Dr. David Crane’s upcoming first yahrtzeit. Mr. & Mrs. Michael Loskove on the occasion of the yahrtzeit of Randi’s mother. Mr. Joseph Nagar on the occasion of his mother’s yahrtzeit. Mr. & Mrs. Steve Miretzky on the occasion of his grandparent’s upcoming yahrtzeits. In honor and appreciation of Rabbi Cohen. See page two. Mrs. Louise Mermelstein on the birth of a great-granddaughter, born to Mr. & Mrs. Dovi Mermelstein and a great-grandson, born to Rabbi & Mrs. Binyomin Meystel. Kollel Boker for finishing Hilchos Tzedakah. Rabbi & Mrs. Shlomo Rosen on the bar mitzvah of their grandson. 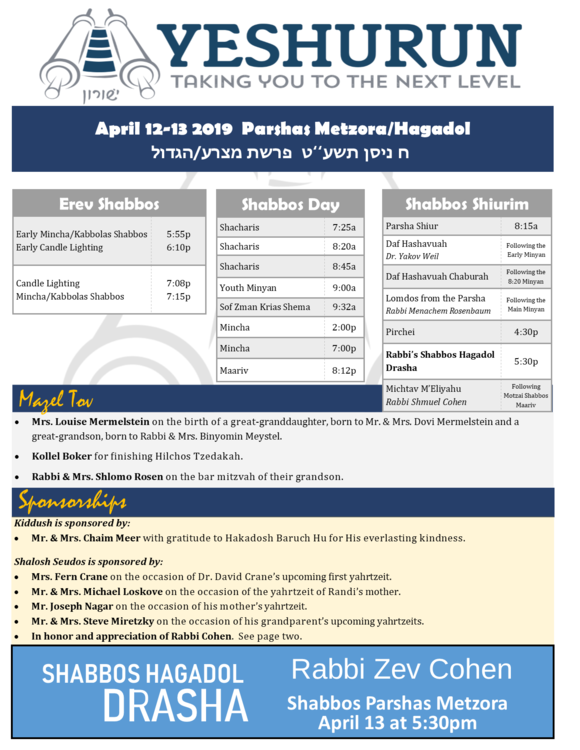 Shabbos Hagadol Drasha from Rabbi Cohen is THIS Shabbos, Parshas Metzorah April 13 5:30pm. This Shabbos at each of the Minyanim before the Sefer Torah is removed from the Aron, as an act of respect towards Sifrei Torah, fifteen minutes will be spent learning Torah. As this Shabbos is Shabbos Hagadol, it is recommended that everyone learn Iynanei Haggadah. We ask that everyone prepare in advance by bringing a Haggadah to shul. The Stewart Sheinfeld Father and Son Learning Program will not be meeting this week. Pirchei will meet at 4:30pm Shabbos afternoon. 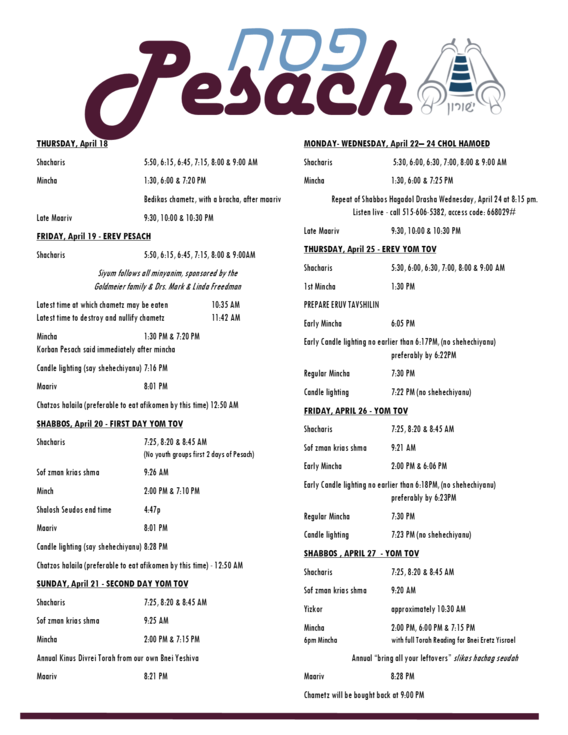 Reb Nochi will be giving a Shabbos Hagadol group on Hagadah Shel Pesach. Chometz will be served. The Rov will begin selling Chometz Motzai Shabbos Hagadol April 13 9-11pm at his home and at shul the rest of the week after most minyanim. Please call the shul if you need an earlier appointment. The Rov is available daily for Shailos 2:00-3:30pm at 773-465-2288 and 10:30-11:00pm at 773-262-5413. 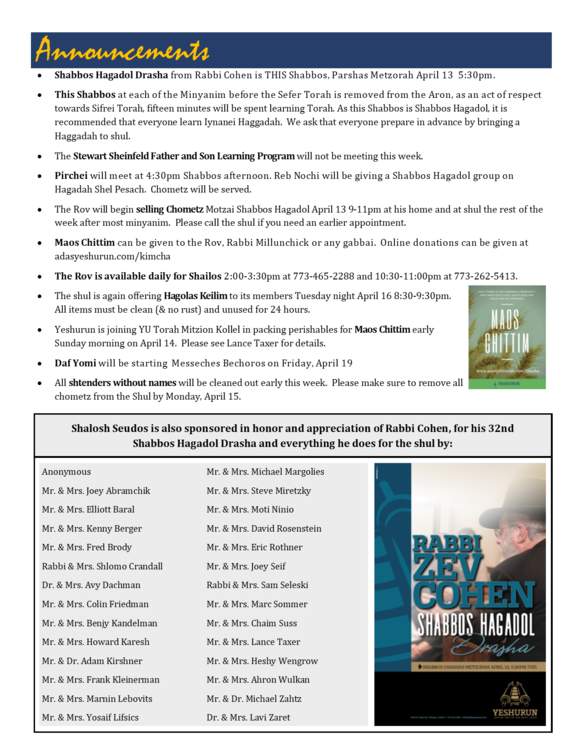 The shul is again offering Hagolas Keilim to its members Tuesday night April 16 8:30-9:30pm. All items must be clean (& no rust) and unused for 24 hours. 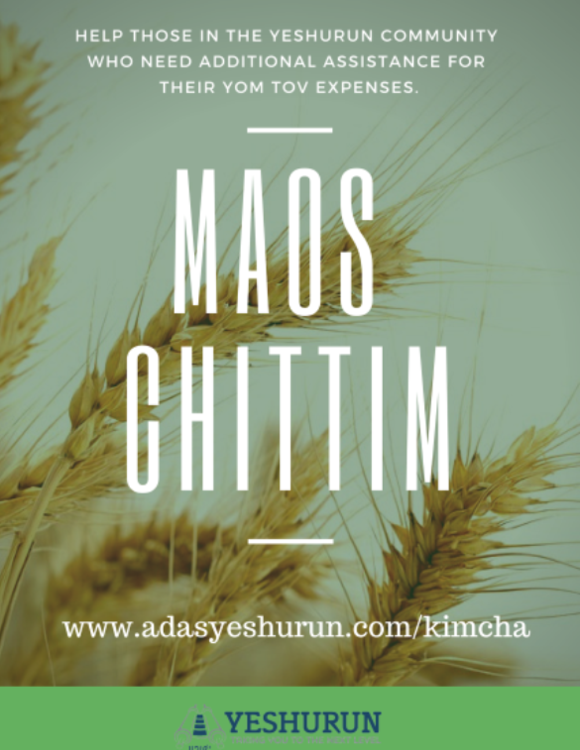 Yeshurun is joining YU Torah Mitzion Kollel in packing perishables for Maos Chittim early Sunday morning on April 14. Please see Lance Taxer for details. 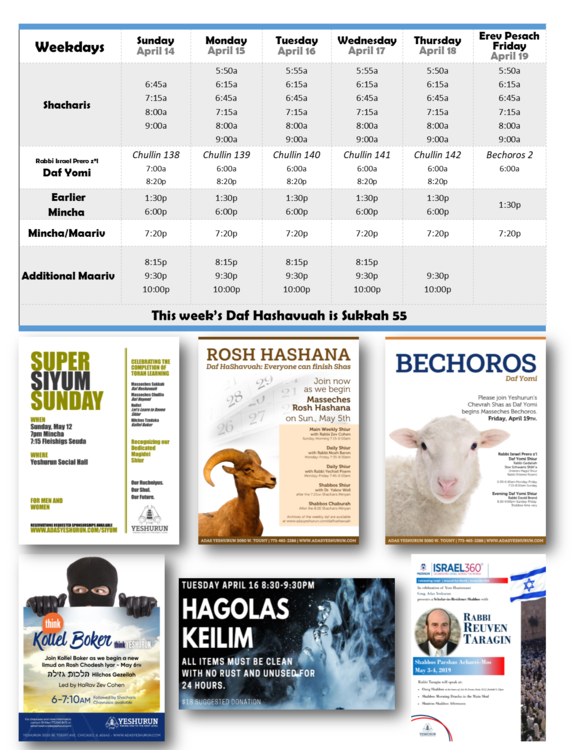 Daf Yomi will be starting Messeches Bechoros on Friday, April 19.